‘Mr Stink stank. He also stunk. And if it is correct English to say he stinked, then he stinked as well. 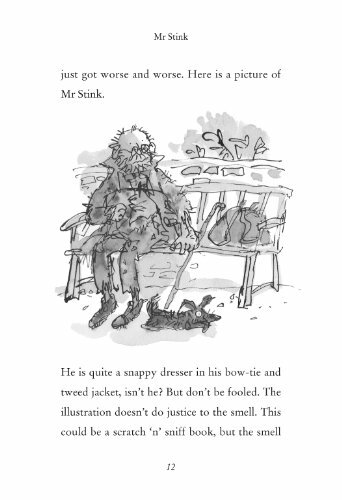 He was the stinkiest stinky stinker who ever lived.’ So the opening lines of David Walliams’s richly Dahlesque comic story, whose title character is not a million miles away from Mr Twit, at least where Quentin Blake’s version of his physical appearance is concerned. Seen from the eyes of over-looked and shy Chloe, rather oddly referred to in the text as a ‘little girl’ even though she is shortly going to be thirteen, the story describes how her appalling mother and mean younger sister are finally taught manners by the old tramp whom Chloe insists on hiding in the garden shed. Intent on a career in politics, Chloe’s mother passes from constituency ambitions to planning to become the next Prime Minister before Mr Stink sabotages her in a series of lavatorial interjections while they are both being televised. But while most of the other jokes are better than these, with Quentin Blake remaining throughout in as fine form as ever, Walliams does not have the same control over narrative as did his clear literary master. While Dahl always stayed within the fantasy rules he set himself, Walliams will suddenly de-rail all credibility by going right over the top. Even so, he writes better than most celebrity children’s authors, and firmer editing could still see him producing something really good next time round.